Brown Butter Cherry Bomb Burger. SUBLIME! Dried cherries ARE the BOMB when paired with a little red wine and Blue Cheese! Not to worry if you can’t locate any dried cherries, craisins will work just as well. Nothing too intricate here, just a straight up, straight forward melding of flavors. I had to make this one when John was out of town because he doesn’t like Blue Cheese or nuts in/on/around his food. I know, poor boy! Be careful with these, those little pieces of fruit stick to the grill. Be sure to get that grill nice and HOT when you lay those burgers on the grate to get a good sear so they won’t stick. Then turn your temperature down. Don’t forget to serve them with extra crispy, baked Sweet Potato Fries. Let soak until nice and plump – over-night is great, but if you’re in a hurry you can heat them up over low heat, but be sure they’ve cooled COMPLETELY before mixing them with the beef. remove from heat before they turn color. you can make this combination to your own taste. Set aside. Make into six equal patties. Grill to desired doneness. At the risk of repeating myself: Be careful with these , those little pieces of fruit stick to the grill. Be sure to get that grill nice and HOT when you lay those burger on the grate to get a good sear so they won’t stick. Then turn your temperature down. 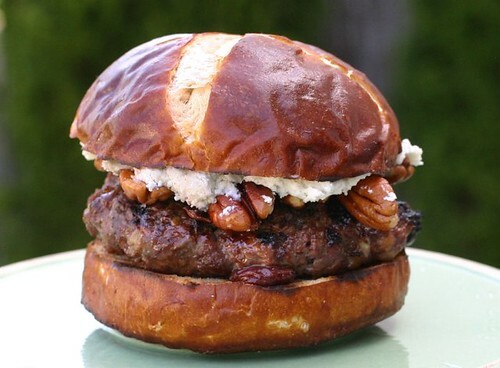 Toast your buns on the grill – I used pretzel buns, but any nice bun will work well. If you’d like you can also spread the cheese mix on the bun and place the pecans, so they stick real well, before the burgers are done like above photo with the lid on. Now that’s a burger!! We’ll give these a try. I’m in love with the sauce. What a great way to kick up a burger. Interesting way to prepare and present. Never would have thought! I love all the ingredients that you have in that burger. YUMMO! wow these just keep getting better and better pecans and cherry fabulous! love the cherries in there! i’ll have to try that soon. another great creative burger post! All I had to read was pour red wine over cherries and I was sold. Love the cheese, love cherry burger, and love the look of that bun, where do you get pretzel buns? it’s very interesting,a great way to make a burger! Looks out of this world. Transporter please, destination: your house. Wow! What a wild combination. I can see how it would work, but I am sure it would take me a lot to come up with it. now I just knew this was gonna be a turkey burger when I first started reading – but noooooo – great, just great…..
That has got to be the most radical burger I’ve ever seen!! I love the look of those pretzel buns – I actually thought they were little brioche at first! Magnificent! 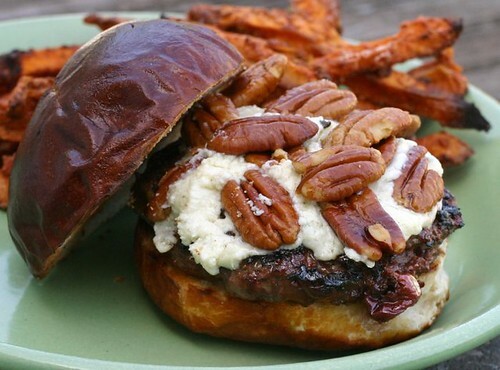 Love those buns…Great looking burger! After pondering this recipe we finally endeavored to devour it. It was shockingly wonderful, both in it’s simplicity and flavor aspect! We couldn’t find mascarpone cheese so we substituted honey-nut cream cheese instead. WOW! SO glad you let us know! Tried these last night for the first time – fantastic! I couldn’t believe how well the pecans added to the flavor. It would have been easy to skip them but they add so much. After trying this (and the Curry Burger last week) I don’t think we can go back to plain hamburgers. Woo-Hoo! John has no idea what he’s missing! This looks amazing as well. Never would have put nuts on something like that but it looks amazing. Wow. Wow! That’s a burger! It’s looks delish, can’t wait to try it. Found you via foodgawker and adding your site to my favs. Thanks! I’ve never heard of a burger like this before, but it looks fabulous! The cherry/pecan/bleu cheese combo sounds out of this world! Wow, I have not had burger with blue cheese and cranberry-raisin or dried cherries, so this is cool, the pictures are yummy! Pecan too, wow. Too bad John does not like it. I just found this via Tastespotting and love it! I mixed craisins into turkey burgers once for a Thanksgiving burger but this seriously amplifies that idea and makes it infinitely better! Oh yeah, you had me at brown butter! This looks crazy good! What an interesting combination of flavors. I love blue cheese and fruit together but in a burger? Not sure. Sounds and looks amazing though.